Writing is a way of communicating across time and space. As a teen, I remember a friend ruminating about how his letter was going to time travel to me, and that when I read it, a week or so hence, I’d be in his past. When I read my teen diaries, I’m conscious that I am time travelling back to visit with another self, and I wish I had a little more of value to say about the times and experiences I was having! I was, sadly, a very boring diarist, as I explored my particular obsession ad nauseum. Nonetheless, the power of that time travel is still with me. My diaries are messages to the future that are still there, waiting for an even further flung future. My thoughts, my worries, my dreams are all congealing on those pages, just waiting for a future someone to read the message. Unfortunately, the communication is one way. How I wish I could send a message back to that young diarist and tell her that it would all work out: every last bit of it, as perfectly as could be wished, and assure her that she would find the meaning of the life story she was struggling to understand. 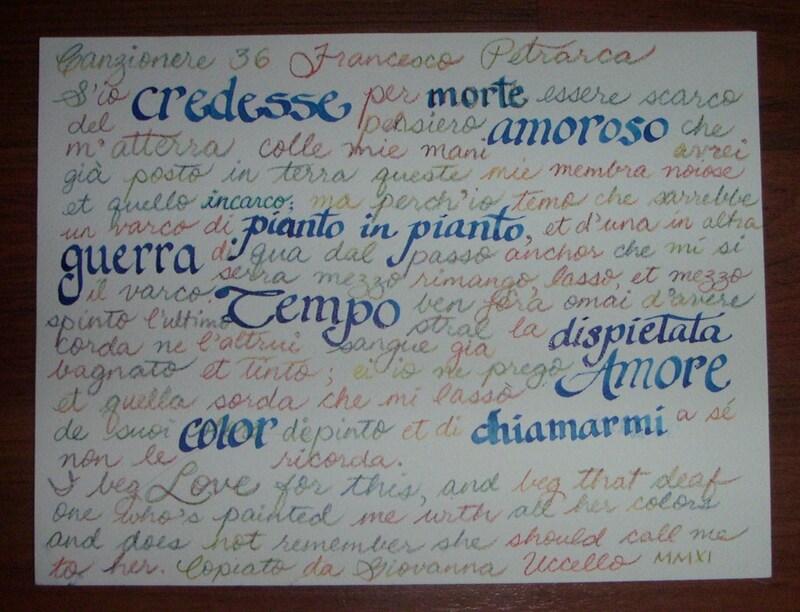 These days, I am spending a lot of time with Francesco Petrarca, a man who loved to write as much as he loved to read. Letters, poetry, essays were left behind him in a tidal wave of very well edited paper. He left us so many messages to the future that are still quoted by philosophers, theologians, historians, and poets. He was a fascinating guy, and it is amusing to read some of the commentators who evaluate Petrarca’s own perception of himself. He was apparently a blatantly proud self-promoter, using his celebrity with aplomb and thoroughly satisfied with his own worth. Although he wrote of his frailties of faith, his words suggest that he was humbly proud. He would be blissful that we are still pouring over his words today, and yet not particularly surprised about it. He believed his words were worth something significant; after all, his master work was his “Letter to Posterity” which he fully intended for people to be reading long after his death. I am absolutely adoring the ‘Franco’ who is being revealed to me as I read his writings, and those of the philosophers, historians and such who have analyzed his life. I think I’m falling head over heels in love with him, actually. Funny how his intellectual charisma reaches across time through his words, and draws us to him. I can see him at a cocktail party, gathering an audience as he asks tricky questions, delights in argument and good conversation, and has everyone enchanted. Thanks for your words, Franco. I wish I could travel back to 1370 and tell you myself. On July 20 & 19, 2010 it was the 306th anniversary of the birth of Francesco Petrarch in Arezzo, Italy and the 236th anniversary of his death in Arqua near Padua Italy 70 years later. Petrarca will feature prominently in my life over the next few years, and I am finding him a fascinating man to get to know. Aside from his romantic tale of woe, as re-told briefly in Grace Awakening, he was a significant intellect of his time. It was his interest in Classical studies that ushered in the Renaissance. He was the one that coined the term, “The Dark Ages” for the Medieval period when men of intellect stopped studying the classics and lost themselves in church pronouncements and reinterpretations of history. His writings were used to establish the language rules for modern Italian. He was declared the Poet Laureate of Rome in 1341 when he was only 35 years old. His name is attached to the sonnet form he developed: the Italian or Petrarchan sonnet. As Petrarca travelled around Italy and France, he collected the finest library in Christendom, one fought over after his death. Here is a man who loved learning, celebrated travelling for new experiences, delved into history to better understand himself, climbed mountains for the aestetic of seeing the view at the top, struggled with faith, and loved purely with a devotion that was stronger than death. One of the most wonderful (and challenging) things about Petrarca is that he was a prolific writer. He wrote volumes and volumes about his life, his thoughts, and his beliefs. He wrote poetry about his love. He wrote biographies of those he admired. He wrote letters to his friends. Most of his writings survive, because his genius was well-recognised at the time. There is a lot of material to go through! As I unfold the layers of his life, I hope that I can do justice to the story and that the embellishments I bring will be worthy of him. He is surprising and amazing me at every turn. It’s not going to be a quick book to write. I have 70 years of writings to work through and tons of things to learn about the time and place. I just hope this amazing man will captivate you when I am finally able to introduce you to him in a few years.